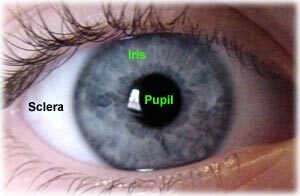 The sclera is "the whites of your eyes", the white outer coat of the eyeball that surrounds the cornea all the way back to the optic nerve. Do not confuse this term with "multiple sclerosis", a disease involving the central nervous system. This term appears on MSDS's in reference to symptoms or potential eye damage. The sclera may be damaged by corrosive chemicals or vapors. Always wear proper eye protection and know the hazards of the materials your are working with. Gross Anatomy of the Eye at the University of Utah. Conjunctival and Scleral Disorders at the Merck Manuals Online Medical Library (click on the Topics links to read more). Parts of the Eye at RIT. What is the structure of the sclera, episclera and Tenons capsule?, part of an ocular pathway study guide at MedRounds. See also: Conjunctivitis, eye wash, nystagmus.